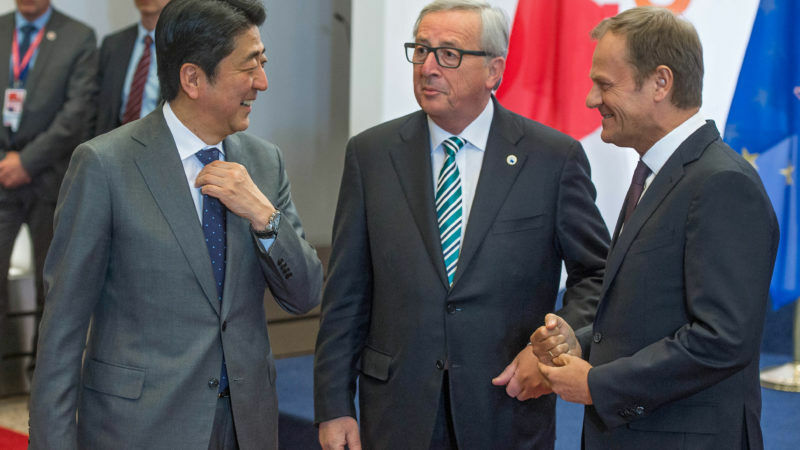 The EU and Japan are cooperating on multiple fronts, but there is much more these two strategic partners could be doing together, writes Fraser Cameron. Fraser Cameron is a senior adviser at Cambre Associates and director of the EU-Asia Centre. The EU and Japan are always viewed as like-minded partners with relations underpinned by a strategic partnership. Now both sides are moving towards a comprehensive economic partnership (EPA – more than an FTA) and a strategic partnership agreement (SPA). The former should give a much-needed boost to trade relations. But will the SPA be the key to a more productive political relationship? Both partners are of course very different. The EU is a block of 28 members with its attention focused on itself and its immediate neighbourhood. Japan is a strong unitary state, constitutionally prevented from playing a military role abroad and situated in a very troubled neighbourhood. For Japan, the big threat is China, a fast-growing power and Japan’s traditional rival for influence in East Asia. More recently North Korea has emerged as a major new threat with its testing of intercontinental ballistic missiles that often land in the sea near Japan. The Japan-China relationship is fascinating because while there is a frosty relationship on foreign and security policy there is a booming economic and trade cooperation. Japan’s nationalist Prime Minister Shinzu Abe and his Chinese counterpart, President Xi Jinping, both have family ties that go back to the period of warfare between the two nations. This personal aspect should not be forgotten. Equally, they could be remembered for leading their countries towards a genuine reconciliation. Both Japan and China claim control over the uninhabited Senkaku/Diaoyu islands in the East China Sea. The islands are under Japanese administration and protected by the US alliance guarantee. Tokyo and Beijing also haggle over the islands in the South China Sea with China claiming sovereignty over nearly all of the Sea and Japan insisting on respect of international law. Japan’s number one strategic ally is the US and Abe has gone out of his way to establish a relationship with President Trump. He was the first foreign leader to visit Trump, even before the inauguration, and has cemented relations on the golf course. But Trump was the candidate who questioned the usefulness of the alliance with Japan (and Korea) and castigated the trading relationship with Japan as ‘unfair’. Now he has backtracked on defence (even though Japan only spends 1% of its GDP on defence), but not on trade. At the end of his Japan visit, Trump vowed to end the trade imbalance without offering any details. Japan was bitterly disappointed when Trump pulled the US out of the TPP. It is now leading efforts to salvage the agreement with the other eleven partners. Japan has supported a new quad arrangement involving the US, India and Australia to discuss and cooperate on maritime security. But the alliance with the US trumps all other relations and Abe’s cosying up to Trump poses difficulties for the Europeans. To some extent, there is a competition for scarce American resources. Can the US still afford to defend Europe and Asia? 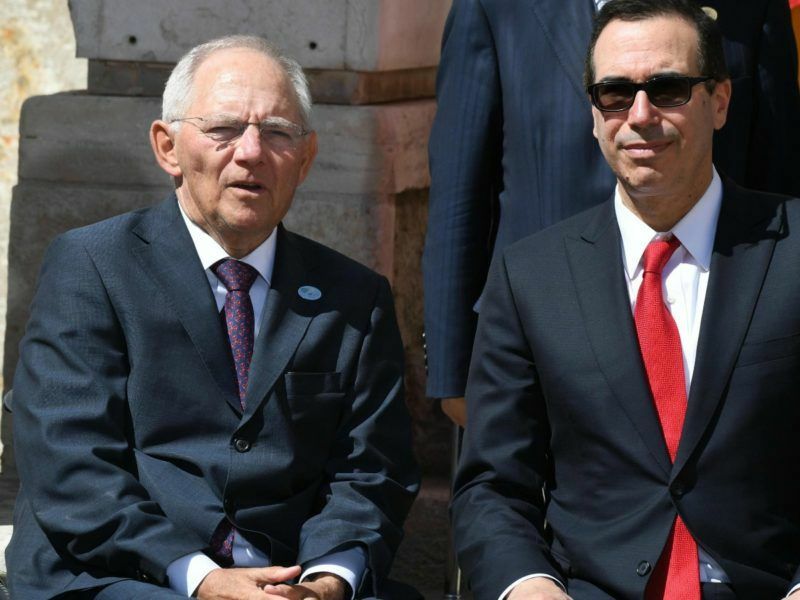 The United States said on 13 May the world’s other rich economies were getting used to the policy plans of President Donald Trump, but Europe and Japan showed they remained worried about Washington’s shift. Japan has not wished to do anything to upset Trump as regards North Korea and Iran. The EU, however, would place more emphasis on establishing a dialogue with North Korea and ensuring the Iran nuclear deal is maintained. The EU and Japan are cooperating in anti-piracy operations in the Gulf of Aden and stability missions in Africa. They are both concerned about Russia’s ambitions. But there is much more these two strategic partners could be doing together. In Afghanistan, both have a vital interest in stability and security of the regime. In Myanmar, they both want to see peaceful change without ethnic cleansing. They could do more behind the scenes to promote human rights and the rule of law in ASEAN. They could do more together to ensure the commitments under the Paris agreements are fulfilled. And they could work more closely in the reform of global institutions, under threat from the US and China. Japan has good relations with a number of EU member states on security, notably the UK and France, and this could be further extended. Security cooperation could also be deepened on hybrid threats, terrorism and cyber warfare. In term of EU-Asia connectivity, the EU and Japan could do more under the auspices of the Asia Europe Meeting. An ASEM summit will be held in Brussels in October 2018 and this could be an opportunity for the EU and Japan to showcase progress on connectivity. 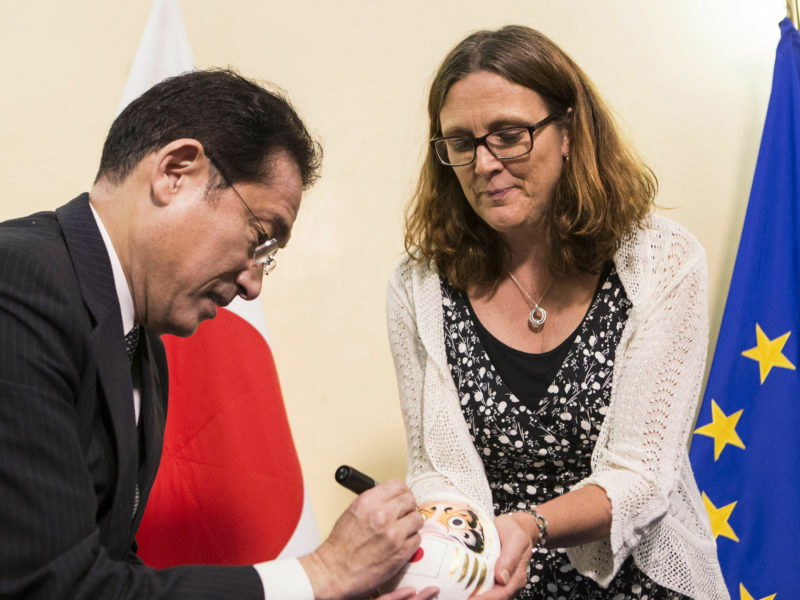 As the EU and Japan move to finalise negotiations for a new political and economic relationship, there are many open areas for closer cooperation. Given the uncertainties in the US and China, it is a timely moment to move ahead.